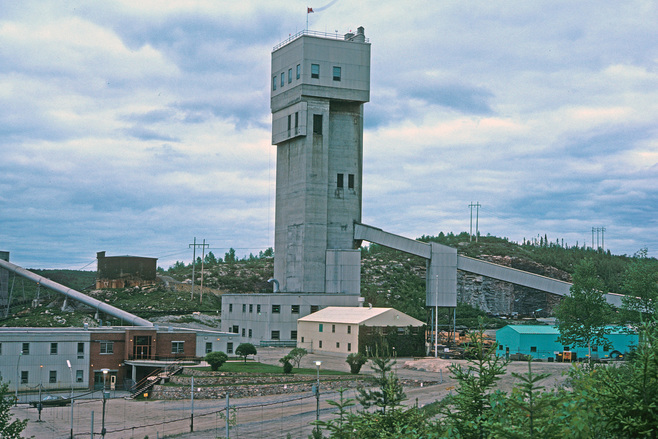 A copper-zinc mine located 200 km East of Thunder Bay near Manitouwadge. Ore is an Archean Cu-Zn massive sulfide deposit. Mine is at least to the 2,850 level. This volcano-sedimentary deposit has been affected by an amphibolite facies metamorphism (T=650 °C, P=6 kb) resulting in the formation of rocks such as gedrite-cordierite gneisses (cf. Petersen, 1984). Reference: Canadian Mineralogist 31, 695; Pan, Y., Fleet, M. E., Barnett, R. L., & Chen, Y. (1993). Pyrosmalite in Canadian Precambrian sulfide deposits; mineral chemistry, petrogenesis and significance. The Canadian Mineralogist, 31(3), 695-710. Reference: Canadian Journal of Earth Sciences, 1992, 29(7): 1375-1388; Pan, Y., Fleet, M. E., Barnett, R. L., & Chen, Y. (1993). Pyrosmalite in Canadian Precambrian sulfide deposits; mineral chemistry, petrogenesis and significance. The Canadian Mineralogist, 31(3), 695-710. 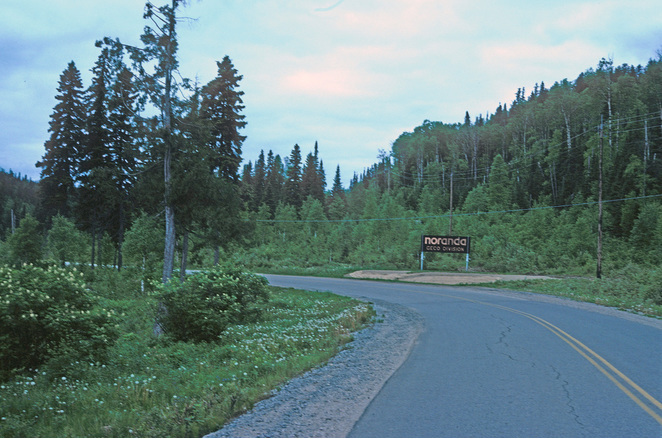 Reference: Franklin, J M, Schnieders, B R, Koopman, E R (1991) Mineral Deposits in the western Superior Province, Ontario (Field Trip 9) Geological Survey of Canada, Open File 2164; Satterly, J. (1977) A Catalogue of the Ontario Localities Represented by the Mineral Collection of the Royal Ontario Museum; Ontario Geological Survey Miscellaneous Paper MP70,464p. 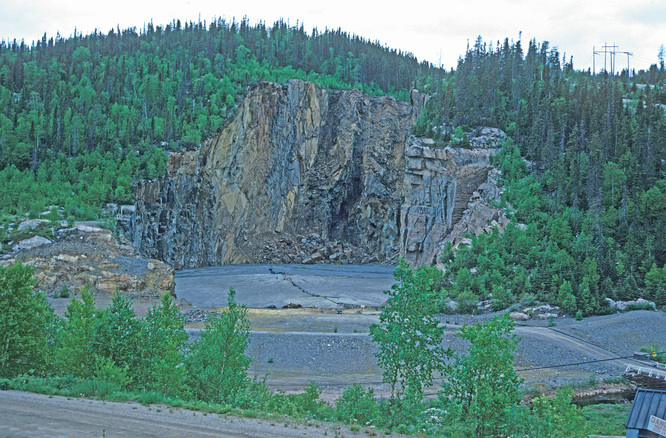 Reference: Contributions to Mineralogy and Petrology Volume 101, Number 3 / March, 1989 Pages 350-360; Franklin, J M, Schnieders, B R, Koopman, E R (1991) Mineral Deposits in the western Superior Province, Ontario (Field Trip 9) Geological Survey of Canada, Open File 2164; Canadian Journal of Earth Sciences, 1992, 29(7): 1375-1388; Pan, Y., Fleet, M. E., Barnett, R. L., & Chen, Y. (1993). Pyrosmalite in Canadian Precambrian sulfide deposits; mineral chemistry, petrogenesis and significance. The Canadian Mineralogist, 31(3), 695-710. Description: Occurs in an Archean Cu-Zn massive sulfide deposit. Reference: Can Mineral 1982 20: 549-553.; Franklin, J M, Schnieders, B R, Koopman, E R (1991) Mineral Deposits in the western Superior Province, Ontario (Field Trip 9) Geological Survey of Canada, Open File 2164; Canadian Journal of Earth Sciences, 1992, 29(7): 1375-1388; Pan, Y., Fleet, M. E., Barnett, R. L., & Chen, Y. (1993). Pyrosmalite in Canadian Precambrian sulfide deposits; mineral chemistry, petrogenesis and significance. The Canadian Mineralogist, 31(3), 695-710. Reference: Canadian Journal of Earth Sciences, 1992, 29(7): 1375-1388; Economic Geology April 1986 v. 81 no. 2 p. 323-342; Can Mineral February 1997 v. 35 no. 1 p. 105-118 ; Pan, Y., Fleet, M. E., Barnett, R. L., & Chen, Y. (1993). Pyrosmalite in Canadian Precambrian sulfide deposits; mineral chemistry, petrogenesis and significance. The Canadian Mineralogist, 31(3), 695-710. 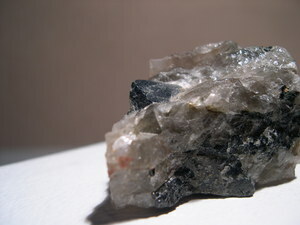 Reference: ontariominerals.com; Can Mineral 1982 20: 549-553. Reference: ontariominerals.com; Contributions to Mineralogy and Petrology Volume 101, Number 3 / March, 1989 Pages 350-360; Can Mineral 1982 20: 549-553. Reference: Stevenson, R.K. and Martin, R.F. (1986) Implications of the presence of amazonite in the Broken Hill and Geco metamorphosed sulfide deposits. Canadian Mineralogist: 24: 729-745. Reference: Michael W. Kieron Collection; Can Mineral 1982 20: 549-553.; Franklin, J M, Schnieders, B R, Koopman, E R (1991) Mineral Deposits in the western Superior Province, Ontario (Field Trip 9) Geological Survey of Canada, Open File 2164; Jas. E. Thomson and S. A. Ferguson, W. G. Q. Johnston, E. G. Pye, W. S. Savage, and Robert Thomson (1957) Metal Resources Circular No. 2 OF THE ONTARIO DEPARTMENT OF MINES Copper, Nickel, Lead, and Zinc Deposits in Ontario (Revised to February, 1957); Pan, Y., Fleet, M. E., Barnett, R. L., & Chen, Y. (1993). Pyrosmalite in Canadian Precambrian sulfide deposits; mineral chemistry, petrogenesis and significance. The Canadian Mineralogist, 31(3), 695-710. Reference: Canadian Mineralogist 31, 695; Canadian Journal of Earth Sciences, 1992, 29(7): 1375-1388; Pan, Y., Fleet, M. E., Barnett, R. L., & Chen, Y. (1993). Pyrosmalite in Canadian Precambrian sulfide deposits; mineral chemistry, petrogenesis and significance. The Canadian Mineralogist, 31(3), 695-710. Reference: Pan, Y., Fleet, M. E., Barnett, R. L., & Chen, Y. (1993). Pyrosmalite in Canadian Precambrian sulfide deposits; mineral chemistry, petrogenesis and significance. The Canadian Mineralogist, 31(3), 695-710. Reference: Franklin, J M, Schnieders, B R, Koopman, E R (1991) Mineral Deposits in the western Superior Province, Ontario (Field Trip 9) Geological Survey of Canada, Open File 2164; Canadian Journal of Earth Sciences, 1992, 29(7): 1375-1388; Jas. E. Thomson and S. A. Ferguson, W. G. Q. Johnston, E. G. Pye, W. S. Savage, and Robert Thomson (1957) Metal Resources Circular No. 2 OF THE ONTARIO DEPARTMENT OF MINES Copper, Nickel, Lead, and Zinc Deposits in Ontario (Revised to February, 1957); Pan, Y., Fleet, M. E., Barnett, R. L., & Chen, Y. (1993). Pyrosmalite in Canadian Precambrian sulfide deposits; mineral chemistry, petrogenesis and significance. The Canadian Mineralogist, 31(3), 695-710. Description: Occurs in an Archean Cu-Zn massive sulfide deposit. Zincian variety. Canadian Mineralogist (1982): 20: 549-553. Petersen, E. U. (1986). 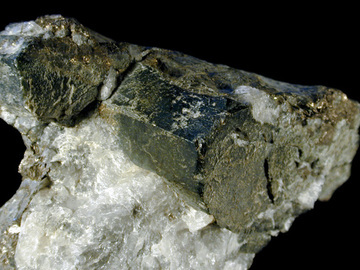 Tin in volcanogenic massive sulfide deposits; an example from the Geco Mine, Manitouwadge District, Ontario, Canada. Economic Geology, 81(2), 323-342. Stevenson, R.K. and Martin, R.F. (1986) Implications of the presence of amazonite in the Broken Hill and Geco metamorphosed sulfide deposits. Canadian Mineralogist: 24: 729-745. Contributions to Mineralogy and Petrology (1989): 101(3)(March): 350-360.